General grocery and household deals are the products to find in Cub Foods Ad. You may browse the latest one on this page. Typical weekly ad deals, as well as extraordinary prices, can be the contents of the ads that are regularly available. Browsable online sales also offer a considerable amount of multiple-buy deals. 10 for $10 sale, rewards, and coupons are usually the tools to save on favorite products of all categories of this supermarket. Cub Foods Weekly Ad coupons are really cool discounts to buy some nice products with multiple-buy discounts. Buy X amount to save Y amount on these items. Also, the coupons can make a purchase a BOGO Free deal. Cub Foods operates with 77 stores in Illinois and Minnesota retailing the grocery products. The supermarket is, in fact, a SuperValu subsidiary. You can encounter the “Cub” name only because they removed the “food” in 2018. Subscribe to the newsletter and get emails about this retailer. Find more discounts other than weekly ads. Rewards, promotions, and coupons are great ways to save on the products of this supermarket. 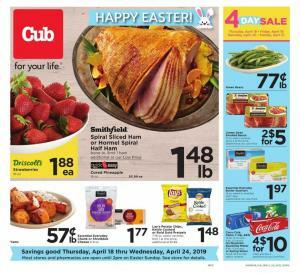 Cub Foods Weekly Ad covers a lot of BOGO Free sale for great food products including natural fresh produce. One of the best ones is Driscolls Raspberries which will be a saving of $3.99 on 2 packs. Buy soda packs in big packs with the BOGO Free deal. Pepsi, Diet Pepsi, Mtn Dew or Sierra mist are in the BOGO Free sale of Cub Weekly Ad. Buy packs of meat and save on the delicious practical foods. Save $5.99 Carando meatballs and make great dinner or lunch meals. More BOGOs of snacks, drinks and pantry foods from the Cub Ad. Restock your 7UP or A&W at Cub stores. Have your sauce ready all the time for the best prices. Willy's Fresh salsa will be BOGO Free, too. Save $3.49 on that product. 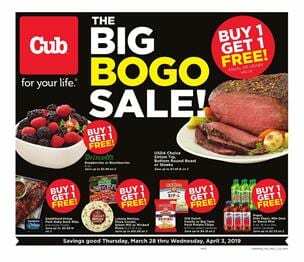 And more BOGOs are also available in the Cub Foods Ad March Sale.